A dumb shooter that feels like a rubbish stealth section dragged out across the length of an entire game. Ghost Warrior 2 has all the hallmarks of a generic modern military FPS: linear corridors filled with thick enemies, strategically placed explosive barrels, one-dimensional characters who spout military jargon, and things exploding. But the difference here is that you're sneaking rather than blasting your way through these tunnels of scripted war nonsense. It's a feature-length stealth section. "This is a bad game with maddening stealth AI, bewildering checkpoint placement, and idiotic ultra-macho dialogue." At first, I gave it the benefit of the doubt. It looks reasonably pretty thanks to CryEngine 3, so I thought it might be an enjoyable parade of shallow but visually dazzling set-pieces. Wrong. This is a bad game with a maddening stealth AI, bewildering checkpoint placement, and idiotic ultra-macho dialogue. But the sniping must be good, right? It is, after all, a game solely about shooting people from great distances. The rifles feel powerful, and there's wind and bullet drop to consider if you're playing on hard. Long, well-placed shots are rewarded with a slow motion bullet-cam, but it's always an anticlimax. There are no worrying, gruesome Sniper Elite-style exploding heads here; enemies just go limp and fall over with a feeble squirt of blood. Much of the game is spent crouching in bushes and creeping past roaming guards. This would be fine if you weren't seemingly fighting an army of psychics. If you're spotted for even a fraction of a second, the entire base will turn their guns on you, somehow knowing exactly where you are thanks to some spooky terrorist hive mind. Then you'll die, and be forced to repeat ten minutes of tiresome sneaking thanks to the frustrating checkpoints. "Stealth would be fine if you weren't seemingly fighting an army of psychics." More successful are the missions where you perch above an enemy base and support a squad of soldiers as they infiltrate it. All your targets are marked for you by a spotter, but there's some element of strategy and timing in taking out guards while their buddies are facing the other way. They're just shooting galleries, though, and only enjoyable because they're breaks from wrestling with the horrendous stealth AI. These were my favourite moments, purely because they were so easy I could rip through them without having to spend more time bored to tears. I barely needed to play Sniper: Ghost Warrior 2. It's like a game of Simon Says. Walk here. Shoot this man. Set up your rifle here. Sneak past these guards. Kill those ones. Now walk over there. Even when you're separated from your spotter, your superiors are barking orders over a radio. Soldiers are supposed to follow orders, sure, but they're also capable of, and expected to, make decisions sometimes. There are some impressive-looking environments, courtesy of the CryEngine. 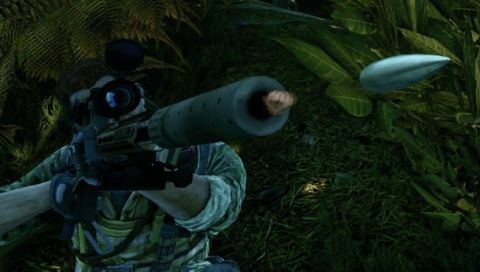 The opening chapter sees you sniping your way through a tropical holiday resort, and later you fight across the streets of war-torn Sarajevo. But it doesn't take long to realise that, as pretty as they are, the levels are just static film sets. I was fleeing for cover, and the game started screaming “LEAVING MISSION AREA” at me, even though I was surrounded by jungle. The locations look big but it's all a not-so-clever illusion. Even with its simulation of bullet physics, Ghost Warrior is no more sophisticated than a Call of Duty game. The tortuously linear missions drag you between utterly forgettable pockets of action, and the story and dialogue are vapid. Don't be suckered in by the promise of Crysis-level visuals: it looks decent, but has none of the innovation or freedom of Crytek's game, despite sharing the same tech.